Bunk beds may be the perfect gift for your son’s next birthday. The American Academy of Pediatrics recommends that children be at least 6 years old before sleeping on the top bunk. 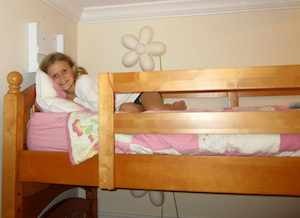 It is best to place the bunk beds against the wall and install guard rails for safety. Honestly, my children have slept in bunk beds before 6 years of age. We did this secondary to space concerns and confidence in their behavior. Your son’s personality/behavior needs to be considered before purchasing bunk beds. Many five year olds can safely sleep on the top bunk, while I would not recommend bunk beds for some six year olds.